I have started compiling information on wool and other fibres used in wool and my initial findings on weaves, qualities, different wool fibres and information I gained from cloth merchants whilst looking around I posted to my blog. I am writing because I am sure that some of the posts I have done may have incorrect information and it would be a pleasure if some of you guys who know a lot about wool, might care to correct some of the information by leaving comments. Many thanks and please do not hesitate to leave a comment if you find discrepancies. Not Everyone Uses The Real Thing - What Is The Real Thing Anymore? Before I begin, I must express that this is my opinion only. Having spent some time now looking at different cloth manufacturers, I would like to express my thoughts about textile manufacturing, not only in Australia but across the globe. Often these days we are lambasted with images of beautiful people wearing luxurious garments and the images are branded so much so that we rarely ask anymore about the quality of the manufacturing and the textiles used in the garments. You often struggle to work out when you buy off the rack what the quality of the wool is - the micron (super value) , the length of the fibres, the mix of wools. It is quite often tucked away, and not all the information is available to the consumer. Then, with regards to manufacturing, the consumer is often presented with the cheapest fabrication options such as fusing instead of horsehair canvas, cheaper stitching and finishing techniques etc. As brands become international and need to pump volume through their distributions channels to improve their bottom line, so they lose control over production and quality. And when the marketing animal comes into play, the cost of presenting the brand across the globe is so expensive that they need to fund this beast with additional profits. Since the price of products is being pushed down further and further by global competition, the brands are unable to extract higher prices from the consumer, so the only way they can do this is by lowering the costs. This could be moving your factory to a place of cheaper labour, using cheaper fabrics or cutting corners on manufacturing methods. This is the reason that when you check the label in most department stores, you will see 'Made in China', 'Made In The Phillipines', 'Made In Turkey' or 'Made In Pakistan'. I am not casting any doubt on the ability of these countries - I have recently heard that countries such as China are now, in some factories, making suits as good as, if not better than, the Europeans.
" A poet`s hope: to be, like some valley cheese, local, but prized elsewhere." Shouldn't we hope that in the end, what we buy is no different from the valley cheese - made local - rather than an Italian brand image featuring very little that is nowadays Italian.Or buying from an Australian brand which has 90% of its garments made in a factory on the mainland of China. Of course, my argument is totally flawed - and I am the first to see that I use Italian and English wools to cut suits here, or that I import Italian silks and cottons to make my bows and shirts. But that is where I started getting upset - when I realised that the Australian government had never fostered a value adding service to the wonderful wool and cotton that we already produce. It is economically prudent to not follow any of my advice, but I believe in trying to keep things local - so that Swiss chocolate is Swiss and an Australian Akubra is made in Australia. And in buying brands that use the real thing - rather than something that is 'almost the same, they won't know the difference, but half the price'. Thankfully, some brands, like the ones below, still use great cloth to create their garments. Simon Rice is the Australian representative for Holland & Sherry. He is rather shy and did not wish to be photographed for the blog. Working from a modest office in the Sydney CBD, Simon has a vast array of bunches for suiting and jacketing for all occasions. I thought I would ask him a few questions on cloth. How long have you been working for Holland & Sherry? I worked for a subsidiary company of Holland & Sherry in Hong Kong before coming to Sydney in 1982 to run Holland & Sherry Pty Ltd, which is also a subsidiary company (not an agent). What is the most commonly sold cloth for suiting in both colour and texture? In metres plain black, midnight and navy super 100's and 120's pure worsteds of 240/280gms. In value 100% pure cashmere doeskin in black, navy and camel 340gms. What is your favourite cloth for a dinner suit? 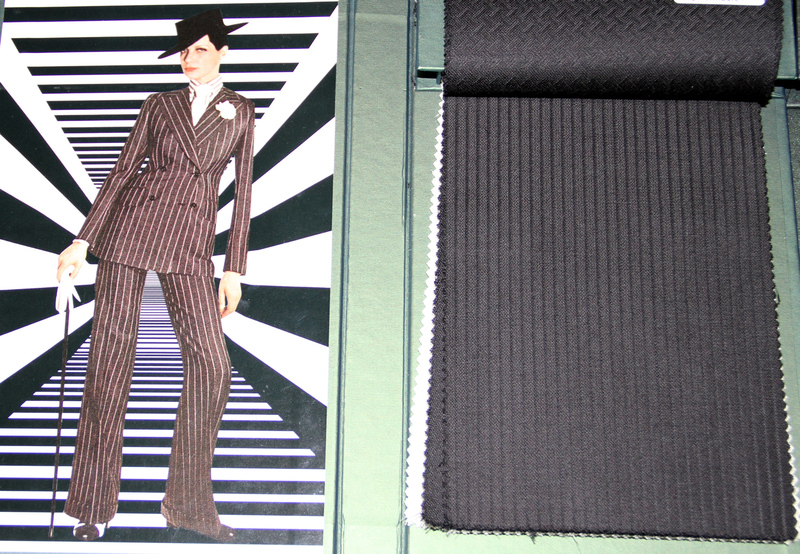 A black faille such as 747101, super 140's wool worsted 280gms. If money no object, then 427008 (black barathea) or 427009 (black faille) , both 280gms 50% super 200's worsted and 50% cashmere. Absolute luxury! What sort of cloth weights should Australian’s be choosing for their climate? Would someone in Melbourne need different cloth to a Sydneysider? For Sydney, 280/310gm cloths can be worn all year round with the addition of a top coat or overcoat for the colder winter days. For Melbourne, although 280gms or lighter is fine for mid summer, heavier cloths such as 380/410gms are more suitable for their winter. What is your favourite navy cloth from H and S and in what texture, weight, weave? I like 379067 a 280gm navy imitation rib in super 130's worsted, whilst classic it has some texture for added interest. Does Holland & Sherry make their own cloth or do they sub-contract mills to make their fabrics? Could you explain to us a little about the different weaves and textures we find in fabric books – what are the most commonly used and why? A twill weave (2 over 2) tends to give more body to the cloth and therefore the finished garment drapes well. If someone was venturing into bespoke tailoring – what would you consider their first acquisition be – a work suit, cocktail suit or dinner suit? I would advise a work suit as this will be worn more frequently than a dinner suit and therefore gives more opportunity to enjoy the the pleasure of a suit tailored specifically for you. What Main Types Of Wool Can I Choose From? Australian Merino wool is known for it's whiteness and softness and over the past fifteen to twenty years there have been substantial wool production advancements in both breeding and production and finishing techniques; so much so that wool which was previously thought impossible to produce is now commonplace. Whereas in the 1960's wool may have weighed 400-600 grams on average, today most working bunches (cloth merchant books containing wool samples) are between 190 grams to 360 grams. There is a global trend towards lighter and finer wool (although there is nothing wrong with well-finished heavier wool which is usually more durable and hard-working for everyday suiting). Another advancement along the way has been a decrease in the diameter of wool hairs in Australian Merino sheep. In decades gone by you would hear the reference to nothing under 24 micron wool. Today, many wool merchants trade in nothing less than 18.5 - 19 micron wool, with high end bunches going to as low as 13 micron wool. To note, the measurement does not mean that every fibre is exactly this micron. It is tested a laboratory to work out the average micron fibre within a batch. The standards therefore mean that in a Super 100 - all wool is an average of 18.5 microns or less. If you are buying wool, you could never check this. That is why you rely on a reputable brand of wool that isn't 'pulling the wool over your eyes' so to speak - brands that have their wools tested and certified. One of the observed requirements of extracting finer wool is that the animals are exposed to harsh climate conditions. For this reason, some of the most sought after light wool (13-15 microns - Super 180 - Super 220) is found where animals roam in small herds in places as remote as the Arctic circle where animals such as Muskoxen produce a very fine wool called qiviut. Extracting such a wool has extremely high labour and processing costs which is why so many of the rarer wools are so expensive to produce and the reason why Australian Merino sheep have been so successful in comparison. Australia offers a naturally harsh environment coupled with excellent farming capabilities. Apart from the diameter (micron) of the wool, wool manufacturers also consider the length of the hairs, the crimp in each hair, the tensile strength of each hair and the number of times a sheep is shorn. Of the Merino flock which we are referring to there are four main breeds: Peppin, Saxon, Spanish and South Australian Merino. When we refer to wool that is of a low micron value (higher $$$ value) we are generally referring to Spanish and Saxon Merino. When you buy a very fine wool, you are most likely buying a wool which comes from Saxon sheep farmed in the wet parts of New England, New South Wales or else the cold and wet parts of Tasmania. Of each fleece that is shorn off a sheep, only 50 per cent can be used for wool production and of that remaining fleece you will extract about two suits worth of wool. Opening Up The Fleece - Here you can see the fineness of the wool and the natural 'crimping' of the fibres. What Are The Main Types Of Weaves I Will Find In Cloths? The most common forms of cloth weaves are plain, twill and satin. Each cloth has a different characteristic. Plain weaves, which are very common, are a simple combination of going under and then over in the weaving process. That is, as the warp (imagine a cylinder of many strands of thread laid out which then passes through a machine set up to look like a series of columns in a grid) is fed through the machine, the shuttle (the thing which carries the thread across the columns of thread) passes back and forth going under and over each thread (creating rows in the grid). Taking the plain weave as a base, now conceive the idea that instead of going over and under each thread with the shuttle, you decide instead to go over two threads before you go under for two. This is a basic twill. Cloths made of a plain weave may not drape as well as a twill. The reason is that the action of going over two and then under, creates an imbalance in weight which dictates that because it is heavier on the 45, it tends to fall towards the ground when it is worn. 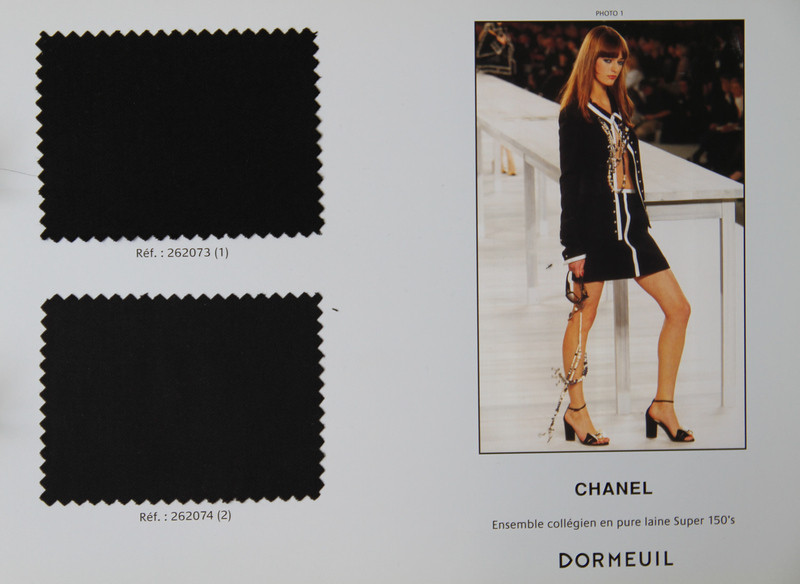 This is the reason twill, or what the French call 'serge' is preferred for its draping effect. Satin, by contrast, is the opposite. With satin, you expose more of the warp (the columns on the grid) by sending the shuttle (which creates the weft or 'rows' of the grid) further along underneath the warp before exposing them again on the top side. Satin, which is derived originally from silk weaving, is a way to show more of the warp of the cloth and usually the end result is a shiny top side with a dull underside on the cloth. Below is an illustration I found on google images. Wool was the main reason I started to look around for information on cloth. It is hard, when you begin hunting down fabric merchants, to actually work out what is what when it comes to grading and marketing of wool - so I had in mind the idea that I needed to clear the air of marketing jargon and work out what constituted a good wool. I will tell you now the answer. There isn't one. It is preference only. But I will tell you about what I learned as I went along for my amateur investigation. Worsted Wool: You hear this term all the time. It is a super 100's worsted wool, it is a super 200 worsted lamb's wool.... bla bla bla. What does Worsted mean? In it's traditional sense, it is derived from the fact that wool was combed so that the long hairs separated from the shorter hairs. Worsted wool therefore refers to the filtration process of drawing out the longer hairs from the shorter hairs to select the best wool. The reason why we worst wool is that the longer hairs tend to be more durable and have a lower chance of breaking apart when they are twisted together. This also means you will have a decreased chance of the wool pilling. How Do We Measure The Length Of The Wool Hairs? The answer is that we usually don't. It is assumed that if you were to buy a super 180 over a super 100 that you would expect the wool hairs to be longer. However, this is not necessarily the case. The fineness of the hair is measured in mircons and this is what changes the category of a wool from Super 100 (18.5 micron average) to Super 150 (16 microns average). However, there is no standard measurement to work out the length of the individual hairs - so you need to ask the question. Generally speaking, hairs range from 2-7cm in length. How Can You Tell The Hairs Are Longer? Generally speaking, if the individual wool hairs that are then binded together to form thread are longer, the end product is a thread which has less knots and kinks in it. Less knots and kinks in the individual threads are likely to create a smooth fabric when the threads are woven together in the jacquard loom. If the fabric is smoother then it will refract more light. This is why when you look at fine wool cloth, it has a more generous lustre and play in the light than coarser wool. Coarser wool tends to have more 'matt' qualities as less light is refracted by the porous nature of the physical imperfections in the wool. Why Do We Blend? Blending types of wools and blending wools with silks and other natural or non-natural fibres is done to create effects or to increase characteristics of wool. Silk, for example, is an unbroken thread of extremely long filaments. Each filament of silk can be hundreds of metres long when it is unwound from the cocoon of the bombyx mori. Therefore, when you weave silk into the wool you create a smoother fabric which adds a distinct colour difference because silk takes pigmentation differently to wool and refracts light in a different manner because of the triangular prism like shape of each individual silk filament. There are hundreds of reasons why different blends exist - suffice to say that in some cases it is to improve the quality of wool or end fabric, in others, sadly, it is also to lower the cost of production. How Does Super Translate To Microns? We discussed earlier that there are three main ways of weaving a fabric - plain, twill and satin. Under these weaves you then get various ways to change the constitution depending on colours of threads set up on the warp and or weft and different weaving processes to get the following different cloths which I will post images of. They are in no particular order: Herringbones, Birdseyes, Fil A Fil, Checks, Pin Stripes, Chalk Stripes and Houndstooth. NB: Disclaimer, some of the information may not be 100% correct, so please, if you notice any incorrect statements, please leave a comment below the blog entry so that I can clean up the information to make it more accurate. Satin weave cloth - right - which is generally used for lapels on jackets. On the right, satin weave can be mixed with plain weave in the same cloth. 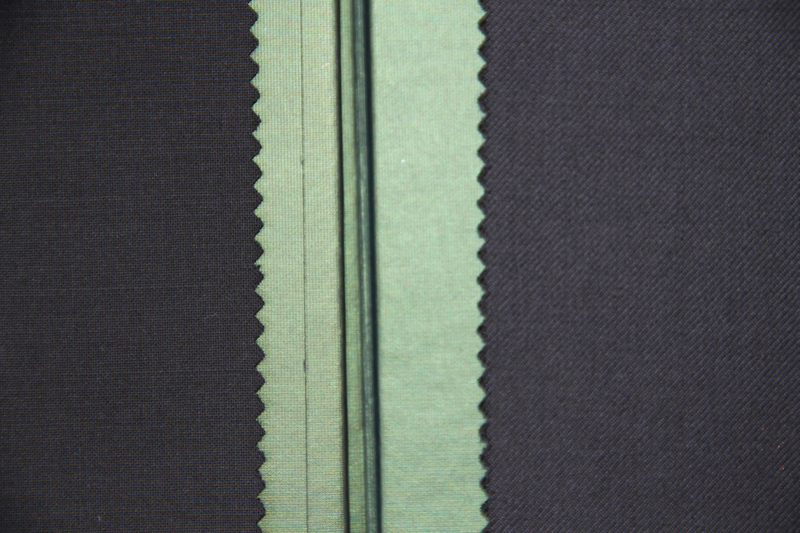 This is an example of a dinner suiting cloth which is a hybrid of weaves. Herringbone on the left, fil a fil on the right. Chalk Stripes, Cable Stripes and Pin Stripes are very popular with businessmen and lawyers. You should be able to expand this image and see the difference more clearly. According to Laurent of Dormeuil Australia, these are the exact same two cloths woven in a different weave, the left being plain weave, the right being twill. You will notice that the plain has less sheen. Further, it is more likely that the twill on the right will drape better and hold it's shape longer through the working day.